I can also hand stamp Sisters, Sister, Big Sis, Lil Sis, or any other word that will fit, or name, or date up to 8 characters. I form it into a bangle bracelet in your choice of finish; brass, silver filled, rose gold filled, 14k gold filled, or sterling silver. Choose a stamping (saying) from the side bar. If you are ordering more than 1 bracelet with different stampings or finishes then add to cart individually. If you are ordering multiple bracelets with the same stamping & finish, you may add more than one at a time to your cart. You may also select "custom" from the stampings list, and then mention your stamping request in "notes to seller" during checkout... 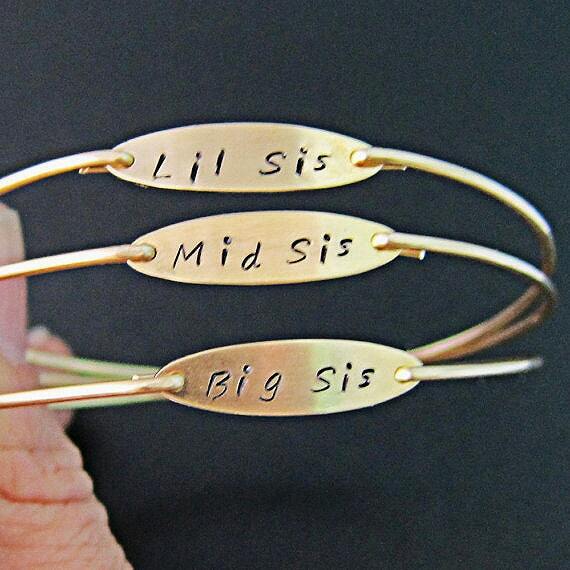 Such as, 3 bracelet order with, Lil Sis, Mid Sis, and Big Sis... Or 3 bracelets with Sisters. You may also specify font in "notes to seller" during checkout. There is the "standard font" seen in the 1st pic, and the "fancy font" seen in the 5th pic above. *** Please note this bracelet is not intended for young children who may be tempted to put jewelry into their mouths as it could become a choking hazard if the bangle somehow broke. 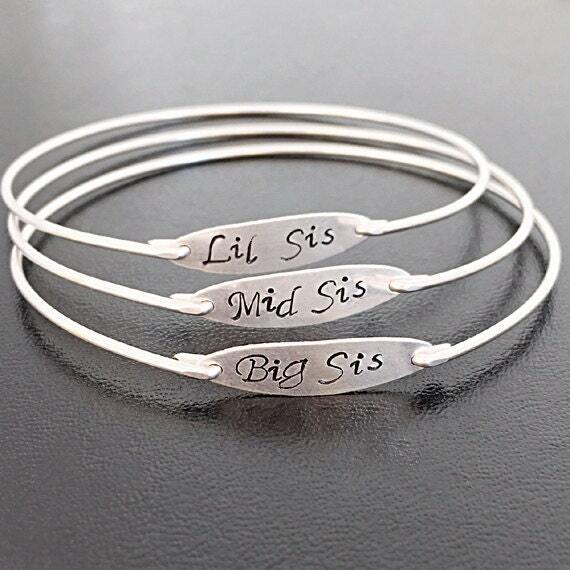 This is intended for little sisters who are growns ups, teenagers or at least pre-teens (in which case sterling silver is suggested if under the age of 13). Please specify size in notes to seller during checkout for your hand stamped jewelry. Choose from one of my regular sizes below by measuring one of your favorite bangles, or give me the circumference of the widest part of your hand where the bangle has to be pulled over; then I can size your sister bracelet for you. All of my bangles are closed and can’t be opened. Therefore, this sister bracelet has to fit over the hand. Small: 2.5 inches Diameter (or 8 inch Circumference) Most Common. 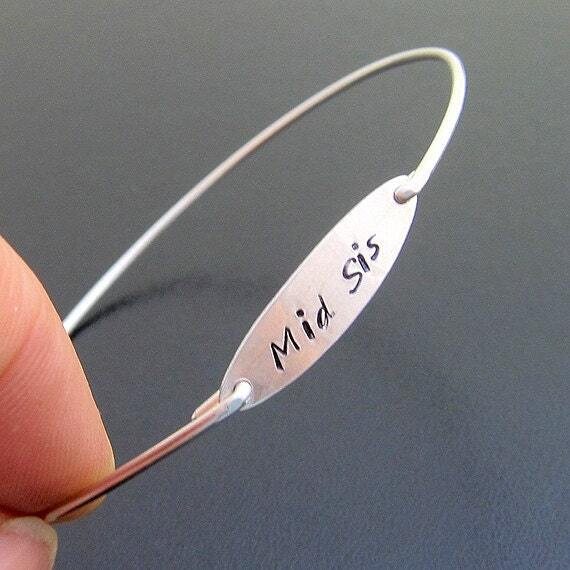 Custom: specify the size you want for your sister gift. This hand stamped bracelet is the perfect present to show your bond to your sister(s).. Make a custom set for you and your sisters! 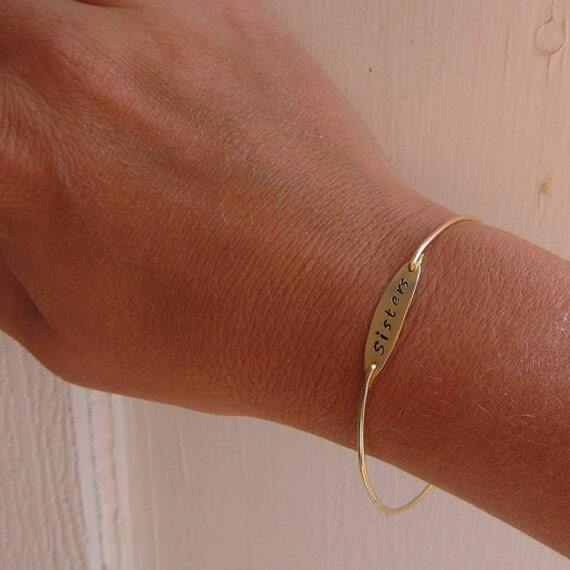 This stamped bracelet created and hand crafted with great care and love for you and yours. All of my items including this sisters jewelry are special handmade creations based on original Frosted Willow concepts & designs. I hope you love your bracelet!